Hydraulic properties, Fluxes, Boundary conditions etc. The optimization problem is a typical dewatering problem: Find the minimum pumping amount that lowers the water table below a certain elevation. Let's first create a simple example. Our example will be a rectangular domain of size 5000 m. The left and right boundaries are considered constant head with 30 and 40 m respectively, while the north and south boundary are impermeable. We will keep thing simple here. We will consider 6 wells around a site that we need to lower the water table. The goal of optimization is to keep the water table around the center of the aquifer (2500,2500) at a radious 650 m below 30 m with the minimum possible pumping. There are two constraints regarding the well locations. The wells cannot be within the area we want to lower the water table and not close to the aquifer boundaries. Let's create the mesh. Since the well locations are unknown we will generate a relatively fine but uniform mesh. If the well locations were constant then we would probably refine the mesh around them. Since the focus of this example is the optimization we will keep everything just simple. That means uniform hydaulic conductivity and recharge and no complex boundary conditions. Assuming a uniform hydraulic conductivity and thickness we can define transmisivity on the nodes. Groundwater recharge is the only flux considered in this example, besides the wells, with rate equal to 4 mm/day. For the wells, their locations and rates will be determined via optimization. However we will add 6 wells in the model with random locations and rates that will be used as placeholders. When the mesh of the domain was constructed the well locations where not taken into account. To assign the well fluxes in the mesh we will first identify in which elements the wells are laying and then assign the rate to the nodes of that element proportionaly with the distance from the nodes. Then for each well we find the distances from the element barycenter, and starting from the closest one we check if the well is in that element. This is actually always true so the loop breaks after jj = 1. The we compute the weights as the inverse distance from the element nodes. The nodes at the left side of the domain (x = 0), will be assigned a hydraulic head equal to 30 m.
In general, any optimization problem that involves the simulation of groundwater flow will actually solve a linear system of equations in the form KH = F where in our case K is the conductance matrix, F represent the fluxes and boundary conditions and H is the unknown vector. In this example we have made some assumptions so that the decision variables do not affect the matrix K. Therefore we can assemble the matrix K once and use it during the optimization. However we can further optimize the procedure. Let's first delve into the system_solve function. The following snippet partitions the system to account for the boundary conditions. First identifies the constant head nodes id_cnst and then partitions the matrices. We can see than the latter is about 5% of the time when we use the first way of solving the system. This maybe trivial for a single run but very important during an optimization that requires 1000s of runs. The code penalizes the wells when they are inside to the dewatering area or far away from it. It also penalizes the solutions that violate the dewatering constraint, which is the groundwater elevation should be less than 30 m.
Important note: This objective function is not the best way to describe the constraints. 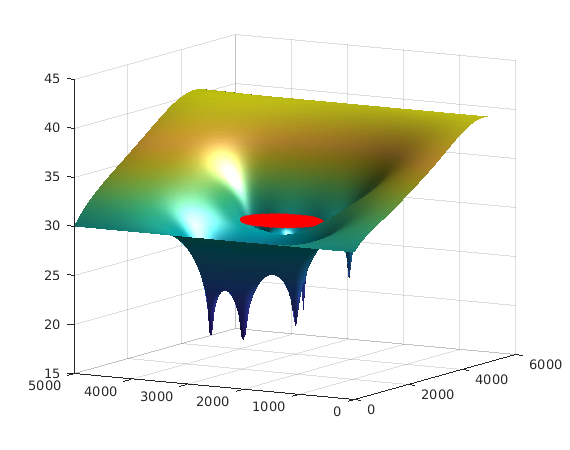 In fact if you start the optimization from a non valid solution then the optimization will most likely fail, and this is because the objective function cannot guide the derivatives to suggest a path from infeasible to feasible space. % x is a vector 6*3 of the decision variables. Note that this objective function requires more inputs than just the vector of the decision variables. 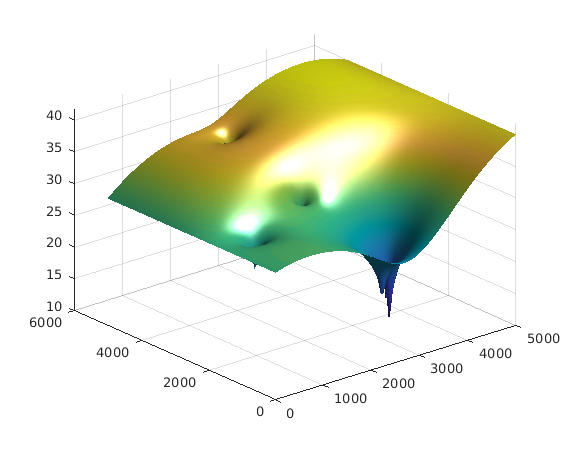 However the Matlab optimization algorithms require that the objective functions have just one input. According to matlab documentation we can create an anonymous function with one input with all other required inputs defined as parameters at creation time. We will define lower and upper limits for the decision variables and some optimization options. Finally we create a starting point that satisfy all the contraints and start the optimization. common options and ignore the FSOLVE options that do not apply. To avoid this warning, convert the FSOLVE options using OPTIMOPTIONS. satisfied to within the default value of the constraint tolerance. Finally we can plot the results. As we did before we have to assemble the FLUX vector. We can see that indeed the water table around the area is lower than the constraint. A tough question to answer: Is this indeed the optimum solution for this problem? Is this an appropriate algorithm to use? Mantoglou, A., and G. Kourakos (2013), An Efficient Simulation-Optimization Coupling for Management of Coastal Aquifers, American Geophysical Union, Fall meeting 2013, San Francisco, California, USA. Kourakos G., and A. Mantoglou (2015) An efficient Simulation-Optimization Coupling for Management of Coastal Aquifers. Hydrogeology Journal 23(6),1167 – 1179, doi:10.1007/s10040-015-1293-7.